Description: This 10-piece TV dinner set is incredibly realistic. The set includes a TV dinner tray with a silver cloth cover that "peels back" to reveal a four course dinner! The dinner tray is exclusive to this set. The set also includes a fork, spoon, and knife, and a colorful pot holder. Designed for children ages 3 to 7 years old. FPT7258 - White rectangular TV dinner tray with 4 triangular food sections. The tray has a permanently attached metallic silver cloth cover that covers the TV dinner tray. FPT7259 - Orange-colored triangular apple crunch serving. The top has molded apple slices with pieces of oatmeal crunch. FPT7260 - Green triangular green beans serving. The beans are "cut" green beans with molded seams on the side. FPT7261 - Yellow triangular macaroni and cheese serving. The serving has yellow elbow-shaped noodles molded together. 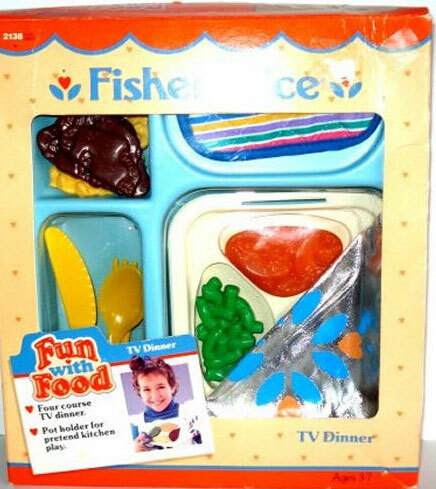 FPT7262 - Brown triangular salisbury steak serving. This could easily be mistaken for a brownie. FPT7263 - Yellow plastic knife with ribbed edges and a tiny heart and "leaves" under the heart molded on the end of the knife handle. FPT7264 - Yellow plastic 4-spoke fork with a tiny heart and "leaves" under the heart molded on the end of the handle. FPT7265 - Yellow plastic spoon with a tiny heart and "leaves" under the heart molded on the end of the handle. FPT7200 - Square multi-colored striped cloth potholder with a blue edge and hanging loop. FPT7266 - Sold in a 8-7/8" long, 9-7/8" high, 2-7/8"deep display box.